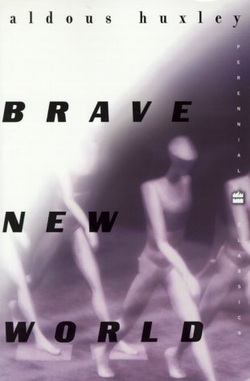 Brave New World is a very famous dystopian science fiction novel published in 1932 by Aldous Huxley. The novel takes place in Earth's future; a great war has taken place and destroyed all of civilization. In this new version of the world, ten people called Controllers hold all the power. Infant minds are conditioned and drug use among adults is encouraged to keep the peace. The book is very thought-provoking because many of the technologies imagined by the author back in the 1930s exist in some form today. Click HERE for a .PDF version of the novel. Here is the audiobook playlist hosted on YouTube. CLICK HERE to take the exam. I will provide you with the code during class. All of the Brave New World assignments have been condensed and organized below. Download the Anticipation Guide here. (This is called "Pre-reading" in the gradebook). Check out the pre-reading PowerPoint HERE. (This was a PowerPoint to look at in class; not an assignment!). Complete Comprehension Questions for Chapters 1-3 on Google Docs. Name the document something like Firstname Lastname -- BNW Ch. 1-3. --> Here are the questions. Add a copy of this chart to your Google Doc for Chapters 1-3 and complete it following the directions at the top. You may share ideas with classmates, but you should all do your own charts. When you are finished, you can SHARE the assignment with me at lbritten@student.godfrey-lee.org (just like you shared your essays). Here are some super awesome slides I made to help you understand the book so far. :) Check these out to review the main points and characters. Study for 15 minutes on Quizlet. (b) Close Quizlet and take your quiz. The sub will give your class the code. The quiz should show you your grade when you have finished taking it. You may NOT use any notes, the book, Quizlet, etc. while you are taking the quiz. Create a new document in Google Docs. Name the document something like Firstname Lastname -- BNW Ch. 6-9. --> For today's work, you will need to RECREATE THIS CHART on your document. -- For each slogan, in the "What it means" column, tell what the saying or slogan means in everyday language. For example, for #10, what it means is that worrying about the past (what was) and the future (what will happen) make a person sick. The person suggests taking a gramme (gram = weight measurement, like you might use in science class) of the drug called soma to help the oneself stay focused on the present day ("only am" = only am existing in the present). -- In the "What it reveals about the World State" column, tell what the saying or slogan tells readers about the World State society. For example, for #10, the saying tells us that people in the World State are encouraged to take the drug soma to keep themselves happy and not worried about things. -- You can talk about the slogans with partners or small groups to help each other understand and come up with ideas, but you must create your own chart for yourself. Complete Comprehension Questions for Chapter 6-9 on Google Docs. Add them ON THE SAME GOOGLE DOC underneath the chart you made for Chapter 6.